Spring in New York usually means a lot of rain – and so far that’s been the case these past few weeks. I have to say, I’ll take the rain any day over snow, but it still means a lot of time indoors as we wait for better outdoor playing weather. 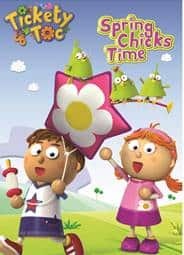 To keep us in the spring mood even on our darkest rainy days are Tommy and Tallulah of Tickety Toc in the latest DVD release “Spring Chicks Time”. 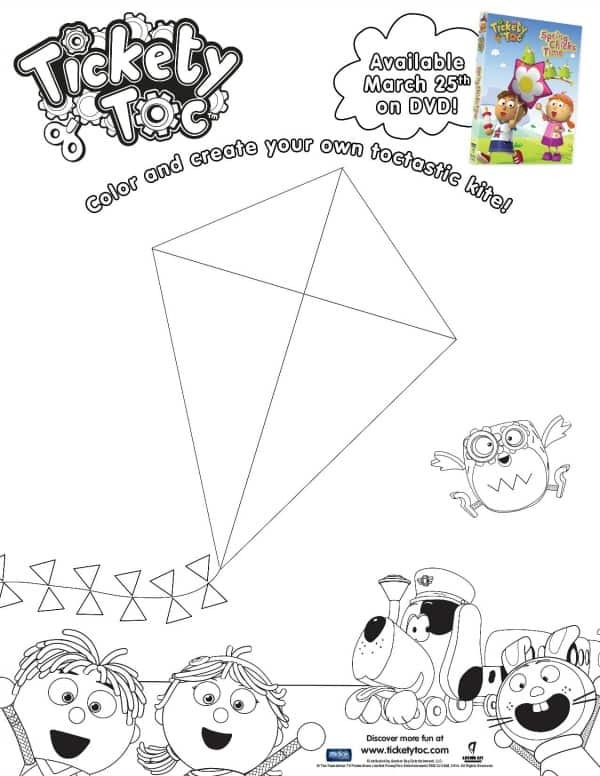 Each episode features Tommy and Tallulah racing the clock in adventures that include trying to save the mischievous Spring Chicks when they fly off in one of the kites from the kite-flying contest. My boys love those little mischievous chicks, so I wasn’t surprised that this is their favorite episode on this disc! The show is a great vehicle for teaching responsibility, teamwork, and problem solving in a fun, wholesome way. This DVD runs approximately 68 minutes, which is just long enough to wait out some spring showers (and a great length for young kids with short attention spans!). If your little one is a fan of the show, this would make a great gift for a birthday, as a special treat or reward, or even as an Easter basket filler. The DVD has an MSRP of $14.98 and comes with a bonus feature of spring coloring and activity sheets. To help celebrate the release of “Spring Chicks Time,” Anchor Bay Entertainment has teamed up with Joy Cone to offer consumers two free Tickety Toc books from Scholastic with the purchase of a Joy Cone product and any Tickety Toc DVD (plus $2.50 shipping and handling). The promotion runs from April 1 through December 31, 2014. I commented on glitter off article.